Parents and spouses traveling abroad are unable to return home. Some have already lost jobs. Children worry about becoming stateless or that their education will be disrupted. Wafa al-Yazeedi with her son and daughter. Bahrain asked them and all Bahraini citizens to leave Qatar. Doha, Qatar: Jawaher has lived in this tiny nation her whole life. But a political showdown threatens to unravel her world, potentially forcing her to move to a country she hardly knows and splitting her family apart. Jawaher's mother is a Qatari citizen, and her father is Bahraini. That fact seldom has caused problems. But when several other Arab nations severed ties with Qatar last week, three of them - Bahrain, Saudi Arabia and the United Arab Emirates - also ordered their citizens to return home or face stiff penalties. "If we are made to go to Bahrain, what are we going to do there?" said the 21-year-old university student, who spoke on the condition that her family name not be revealed because she feared repercussions. "And we are going to have to leave our mom behind. "Our family will be divided." In a region where cultural and tribal ties extend beyond national borders, the deepening crisis is creating havoc in Qatari families like Jawaher's in ways many had never expected. Parents and spouses traveling abroad are unable to return home. Some have already lost jobs. Children worry about becoming stateless or that their education will be disrupted, and family members in different countries are feuding. There's a collective sense that they are trapped by the quest for influence and control in the Middle East. "We have relatives all over the region," said Rashed al-Jalahma, 22, who is also the child of a Qatari-Bahraini union. "We were in shock and awe when we learned we can no longer see them because of politics. What does the population have to do with the problems of the politicians?" More than 11,000 citizens of the three countries live in Qatar, according to Qatar's National Human Rights Committee. And thousands of Qataris live and work in Saudi Arabia, Bahrain and the UAE. At least 6,500 Qatari nationals are married to citizens from these three nations, according to Qatari government figures. Before the crisis, citizens of the six-country Gulf Cooperation Council, or GCC - which includes Saudi Arabia, the UAE, Bahrain, Qatar, Kuwait and Oman - could live and travel freely across the member states. They often refer to themselves as "Khaleejis" - the people of the Gulf. Tensions, however, between Qatar and its neighbors have been simmering for years over accusations that Qatar supports terrorist groups and Qatar's ties to Iran's Shiite theocracy, the primary rival of Saudi Arabia's Sunni monarchy. That lead to last week's expulsions of diplomats and the closing of ports, airspace and borders to isolate Qatar. The small, energy-rich nation, home to a U.S. air base and 10,000 U.S. servicemen, has rejected the allegations as "baseless," saying that it "condemns terrorism in all its forms." "This has made me so sad," said Wafa al-Yazeedi, a Qatari doctor and Jalahma's mother. "We lived and felt like all the Gulf is one country. I have a cousin everywhere." Settling in Bahrain means leaving behind their mother, other relatives, lifelong friends - and their expensive university educations, which the Qatari government pays for. "They are controlling us with the passport," said Jalahma, an aeronautical engineering student. "If the Kingdom of Bahrain revokes my citizenship, so be it . . . I am not worried about losing my passport, but my concerns are about my studies." Jawaher's family is already divided, at least temporarily. Her father was on a work trip in Bahrain when the crisis erupted, and he has been stuck there ever since. "There's no way now for him to come back," she said. On Sunday, Saudi Arabia, Bahrain and the UAE said they had created hotlines to help families who face separation but gave few details. Qatar's National Human Rights Committee dismissed the move as "little more than a face-saving" exercise. Amnesty International called the measures "vague and insufficient." Some affected families worry the hotlines are ways to gather data on those who complain. Both Bahrain and the UAE last week declared it a crime to criticize their policies toward Qatar or show sympathy with Qatar - offenses that carry multiyear jail sentences. "It's fake," said Yazeedi, referring to Bahrain's hotline. "I cannot trust them. I won't call them from my number." In Omar al-Ansari's family, the crisis has struck in multiple ways. His sister and her family - all Qataris - arrived two days earlier, after being ordered to leave Saudi Arabia, where they had studied and worked for six years. Now, she and her husband needs to find new jobs and schools for their five children. Last week, the family's divisions erupted on their WhatsApp chat forum, with an aunt in Bahrain criticizing Qatar and its policies and the Qatari side of the family denouncing Bahrain and its allies. 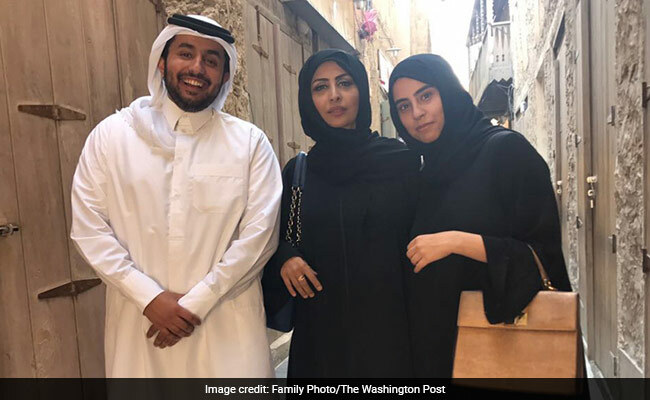 "Our family in Bahrain thinks Qatar is wrong, and we think they are not," said Ansari, 23, a university senior whose mother is Qatari and father is Bahraini. "That's causing friction between our families. It's not a nice situation to be in." His Bahraini identification card has expired. So has his Qatari one. But he can't renew his Qatari ID unless he has a valid one from Bahrain. And if he travels there, he won't be allowed to return because of his citizenship. So he can't open up a bank account, get a new phone or a new driver's license - which also recently expired - or access other government services. "I'm kind of stuck," Ansari said. Jia Naqvi contributed to this report.